I don’t know much about Bette Davis, seems she was a big star in the 30’s and this was her comeback picture (was supposed to be Claudette Colbert but she got sick). Anne Baxter had been in The Magnificent Ambersons, later starred in I Confess, The Blue Gardenia and The Ten Commandments. Movie is over-narrated by both George Sanders (Moonfleet, Rebecca, Voyage to Italy) as a gossip columnist and Celeste Holm (High Society, Three Men and a Baby) as Bette Davis’s best friend. 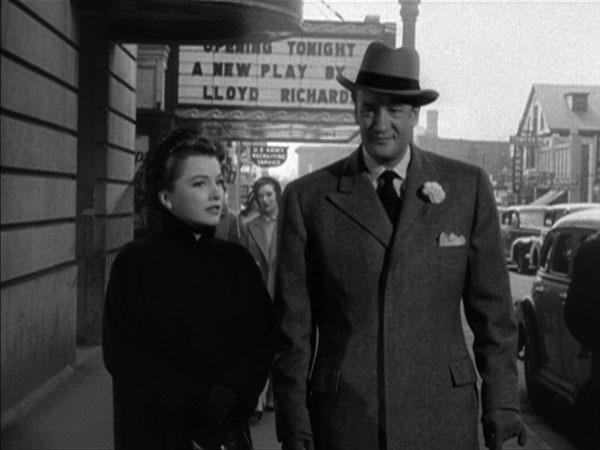 The friend’s husband is “writer” Hugh Marlowe (Earth vs. the Flying Saucers, Day the Earth Stood Still) and Bette’s beau and eventually husband is “director” Gary Merrill (of noir Where the Sidewalk Ends). Marilyn Monroe, a year or two before stardom but already showing her signature persona, has a small part as an aspiring actress. Nice cinematography by Milton Krasner, who worked nonstop through the 30’s, shot some good noir pictures in the 40’s, and worked with Wilder, Ray, Minnelli and Hawks after this. 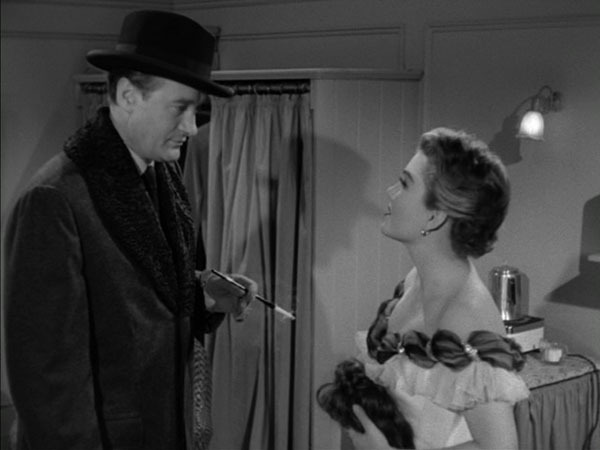 Mankiewicz made this the same year as No Way Out, five years before Guys and Dolls. Um, right, what happened in it? 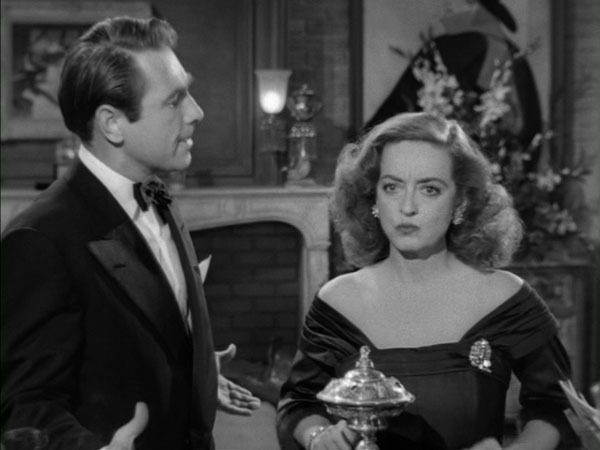 Bette is kinda washed up, I mean still a huge-selling star of stage (not screen) for her celebrated director/beau and writer/drinking buddy, but all the parts are still for younger girls and she’s starting to stretch the definition of young. Enter Eve, superfan who has seen every performance of Bette’s new play. 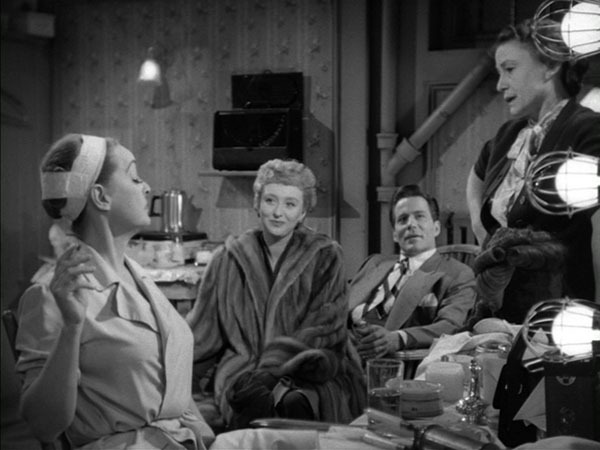 Flattered, they let Eve hang around, but she’s not the innocent thing she claims to be – has been lying about her past and getting cuddly with the two men, conniving to put herself in Bette’s shoes, which she has very successfully done by the end (errr, the beginning, since it starts at the end). Got a record 14 Oscar noms (winning writing, directing and picture) and even some awards at Cannes, beating out Sunset Blvd. The Third Man took it for cinematography, though. Lots (lots!) of self-conscious swipes at Hollywood (even one at the Oscars) and a few at television. I thought it was a little clunky, a little long, a little dry, overall quite good but didn’t strike my passions. Didn’t see Thee Acclaimed Bette Davis for the most part until the end when she is freaking out, and I guess in a couple other parts (see candy-eating scene below). Katy and Dawn liked it, too. Awesome rear-projection shot. They are just pretending to walk, rocking back and forth in front of a screen. Why? 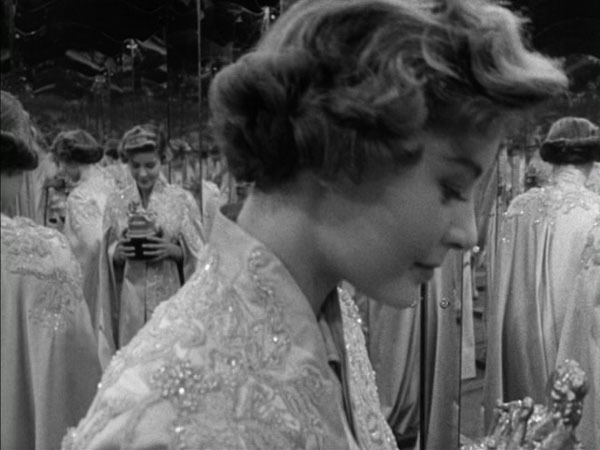 Terrific ending, with a new young hopeful who idolizes Eve and pretends (here, in a three-way mirror) to take her place, the cycle starting over again. This was the signature scene for small-time actress Barbara Bates, who never topped it and committed suicide twenty years later.